Curity Alcohol Prep Pads from Kendall are 2-ply non-woven sponge pads that come in individual packets. These Disposable Wipe Prep Pads are sterile and are saturated with Isopropyl Alcohol. Sealed in airtight foil packets, these Individual Alcohol Packets are designed to clean and sanitize wounds. 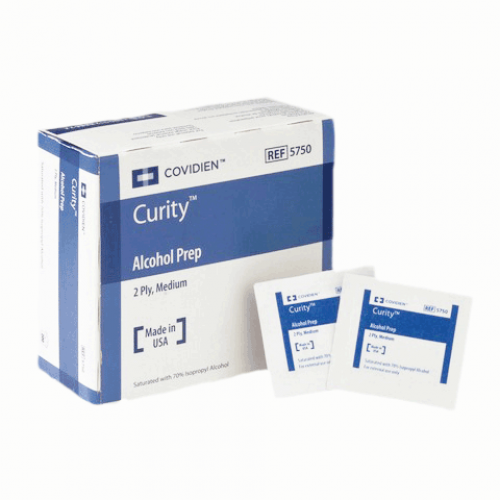 The Curity Alcohol Prep Pad Wipes are medium sized towelettes. Formally known as Kendall 5750. The alcohol pad quality is as strong as any other alcohol pads I have used but less expensive. Excellent product, price & fast delivery! Definitely will be ordering from here again! Best price I could find on line and really quick shipping! Very impressed. I will be ordering from you agian! Ordered this product total 10 for my insulin injection. At first I worried that it may be dry. It deliveried only a few days. The wipes are in high quality. Highly recommended. The product is exactly what they describe. I like that the color of the packaging is the same as in the photos. Other places will send you the same product but in a different color. We like blue because it match the rest of our products. What's even better than the product is Vitality's customer service and delivery. Product came next day even though I did standard shipping. Awesome. Thanks Vitality. I'm a NICU RN and am used to expensive medical supplies. These pads were thicker than I was expecting. I do still get the occasional tear through packaging and product, but they still work great for my home use as a diabetic.